Men's-Wedding-Rings.com (http://www.mens-wedding-rings.com/), the leading online source for men's wedding bands, has just extended its already impressive selection of designer and value ceramic rings. Ceramic is one of the most cutting edge materials currently on the market, and offers durability and strength paired with affordability, a combination that is proving to be irresistible to male shoppers. Men's-Wedding-Rings has a newly expanded selection of Benchmark's designer Seranite rings, as well as great value options in a variety of designs. Continuing its longstanding reputation for carrying a superior collection of men's wedding rings at affordable prices and in a variety of cutting edge materials, online retailer Mens-Wedding-Rings.com has just increased its selection of ceramic wedding bands. Offering both designer and value options, the ceramic wedding bands at Mens-Wedding-Rings.com are being hailed by customers for their unusual yet instantly recognizable appearance. Ceramic wedding bands have a bold, contemporary look that is being increasingly favored by men seeking an alternative ring material in lieu of one of the more traditional metals. Ceramic offers not only a wholly unique style, but a wearable durability and an attractive price point. It's little wonder that men across the country have been snapping up rings from Mens-Wedding-Rings.com's varied and accessible ceramic wedding band selection. At the forefront of Mens-Wedding-Rings.com's ceramic wedding bands selection are Seranite bands from the world-renowned men's ring designer Benchmark, including new styles just added to the site. Seranite is a naturally black ceramic-based material created using Benchmark's proprietary sintering process, resulting in strong yet lightweight bands that boast excellent durability and scratch resistance. These striking dark rings have been popular with customers who crave a high quality alternative to the traditional wedding band. 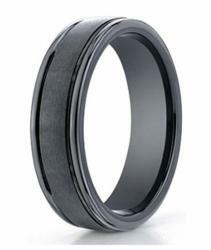 Great value options for ceramic wedding bands can be found on the MWR site as well, and are similarly black in color and are available in both matte and glossy finishes. 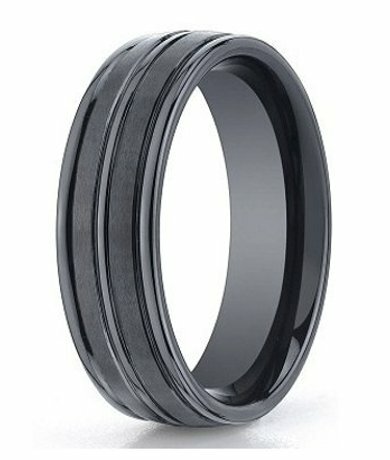 The ceramic wedding ring designs on Mens-Wedding-Rings.com can vary greatly, from a classic flat profile band to a faceted domed profile band, and some styles even incorporate silver or tungsten accents for a sharp, mixed metal look. "The ceramic material has resonated with shoppers who are looking for something unique and affordable, with a high quality look that will last," notes Roy Devine, Mens-Wedding-Rings.com owner. "MWR is dedicated to offering our customers contemporary metals and materials that allow them to express their individuality along with their commitment." Mens-Wedding-Rings.com plans to continue expanding its line of ceramic wedding bands and other alternative metal collections to ensure that customers have access to the best and most budget-friendly men's wedding rings currently on the market. Other services available to MWR shoppers include free domestic shipping, 30 day money back guarantee and lifetime warranty. Mens-Wedding-Rings.com is a niche online jewelry store for men's wedding rings and bands. Customers can find the best quality men’s traditional and alternative wedding rings in this specialized retail environment. From major designer bands in traditional and alternative metals to non-designer rings in stainless steel, titanium, tungsten, sterling silver and cobalt, Mens-Wedding-Rings.com is a one-stop source for men’s wedding bands and rings. Owners Roy and Judy Devine make it their goal to ensure their customers are completely satisfied, selling only high quality rings at excellent prices. MWR customers enjoy free shipping and a 30 day money back guarantee, and have come to expect the highest standards of service, selection and quality when they shop at Mens-Wedding-Rings.com. MWR offers the best selection of men’s wedding rings on the Internet, many of which are available through size 20. For more information on MWR, please visit Mens-Wedding-Rings.com.